Shimmer and sparkle with this stunning wishbone shaped eternity ring. 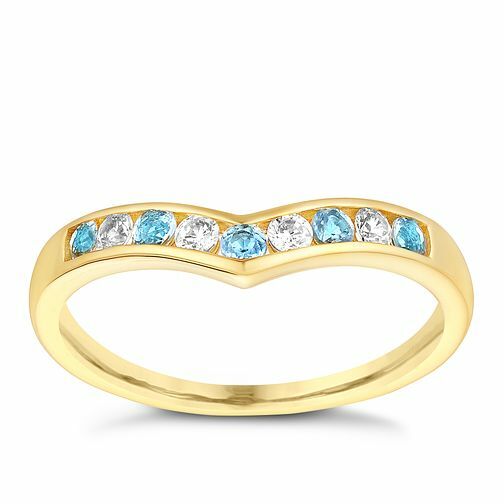 Crafted from luxurious 9ct yellow gold for timeless style, this beautiful ring is half set with glittering cubic zirconias interspersed with pretty blue topaz stones for a fresh, dazzling look sure to capture her heart. 9ct Yellow Gold Cubic Zirconia & Blue Topaz Eternity Ring is rated 5.0 out of 5 by 1. Rated 5 out of 5 by Anonymous from Lovely ring Lovely piece of jewellery. And got for a great price.